Saturday, July 20 2013, 11a.m. This is the third in a series of articles about the Diaconate from Teri Van Huss and Nancy Key, postulants who are engaged in ministry education in a 3-year program at the School for Deacons in Berkeley. In the second year students start Field Education where they serve 240 hours per year in a mentored setting at a local community program. The Field Ed for third-year students, also 240 hours, is a parish placement at a church different than their own. Teri has completed her community placement and will begin a parish placement with Fr. Luis Rodriquez at Church of the Saviour in Hanford. Nancy is beginning her community placement with Clinica Sierra Vista homeless program. Thus, we call this First Forays in the Field – a reflection about how the universe shifts when you are faced with real world situations that are completely out of your experience. We are learning first-hand the role of the deacon as a servant leader, and about the ministry of presence. How can we preach the Good News to someone who needs food, water, and shelter? What does it really mean to “be” with the poor or the sick or the lonely? We are learning that when we help to provide food, water, and shelter or medical assistance or safety from violence, we are indeed spreading the Gospel! The Good News of Christ is channeled through those who love them enough to be with them. So, we invite you to take a walk with Nancy. Today was my first day of street outreach with the Clinica Sierra Vista Healthcare for the Homeless Program street outreach team. Today, I simply “shadowed” Ka and Greg, the two outreach workers I was with. My goal was to learn and do no harm. We drove down to the south part of Fresno, close to the railroad tracks and freeway, with scattered industrial sites nearby. Lining a little-used wide street were ten or twelve shanties constructed from a variety of materials including wood, tents, and cloth. Some were fortified by a gaggle of shopping carts. On a cross-street was one large encampment, covered with large pieces of wood. Greg told me that was the “big house,” meaning the “drug house.” He said there would be a “guard” outside. 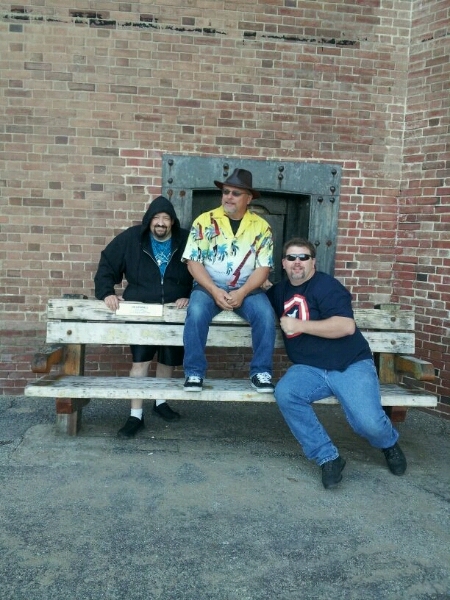 Sure enough, a stern looking man was sitting in a chair just outside the big house. We asked him if he would like some information about health care, and he answered with a firm “no!” We moved on. One of the shanties was made of wood with a cross nailed on it. One arm of the cross said “God loves you,” and the other said “God bless you.” The man was standing outside, and was quite willing to talk about his house. On the outer walls he had affixed wood in the shape of a window, with red pots of flowers painted on it. And paintings on the walls. We complimented him on his house, and he said, “Everything belongs to God: He did everything here.” He clearly was grateful for the gifts of God. After moving along, we encountered a man cleaning up a pile of charred rubble from his encampment. We greeted him and gave him a brochure, explaining that he could get free medical and dental care at the CSV clinic. He – as others had also been – was grateful for the information, mentioning that he had a sore tooth that needed a dentist. We asked him about the rubble. He responded that the fire had burned his place, destroying everything. He wanted to clear the rubble so he could finish constructing a new shelter. The fire was apparently deliberately set because the people weren’t keeping their area neat. Not only did the fire drive out the offending residents, but it also destroyed three other shanties. Each of the people we spoke to – with the exception of the man guarding the Big House – expressed sincere gratitude. We had long conversations with several of them, in some cases about their trouble getting government assistance, in some cases about their medical problems. They spoke of their neighbors, knowing who was home, who was working, etc. So I learned about gratitude, openness, and community. At another encampment – this one next to a canal – we visited with six or seven residents. Several of these residents were sitting outside of their tents. They too were grateful for the information and shared a bit of their needs. After we had been in the area for several minutes, other residents appeared and came up to us. They had heard about the information and first aid packets were brought, and in many cases, seeking them for their friends who were not presently at home. One woman came up and wanted several brochures. She said she had previously recommended the clinic to people, though she hadn’t been herself. She wanted to distribute the information. After she left, we asked one of the residents who lingered to talk with us who was the “mayor.” Well, Sheila is, she said, gesturing toward the woman who had asked for several brochures. “She’s the brightest bulb in the box,” she explained, laughing. We asked her about the cleanliness of the canal water. Oh, it’s dirty, she said. But it’s good for keeping things cold. And I have a place down there (gesturing to a small area of the canal) that I go in the morning to wash up. When you live in the dirt, you get dirty, she said. Her name was Nancy, same as mine. St. Paul’s Episcopal Church welcomes all to our Festival Welcoming Eucharist,Sunday, July 28, 2013, at 4:00 p.m. Light refreshments will be served after the service. The entire community is welcome to come join in song, praise, and thanksgiving for St. Paul’s Episcopal Church in Bakersfield. Bishop Chet Talton will be our celebrant and preacher. Please come and bring friends to join us in our celebration! please be in the sanctuary of St. Paul’s, Bakersfield by 3 p.m. on July 28 to rehearse the piece we’ll be singing: Lord, Make Me an Instrument of Thy Peace by Jody Lindh. Email Miriam Raub Vivian (mvivian@csub.edu) to let her know you’d like to join the festival choir, and she’ll email you a pdf of the music. We welcome The Rev. Eric Law as our conference leader for this year’s ministry event at ECCO. Eric Law is the Founder and Executive Director of the Kaleidoscope Institute, the mission of which is to create inclusive and sustainable churches and communities. For more than 20 years, he has provided transformative and comprehensive training and resources for churches and ministries in all the major church denominations in the United State and Canada. He is the author of 7 books including The Wolf Shall Dwell with the Lamb and, his latest Holy Currencies: Six Blessings for Sustainable Missional Ministries. You may order Holy Currencies on the Amazon website, either in print form or download to your Kindle reader. To read more about The Rev. Eric Law and the Kaleidoscope Institute, visit their website at www.kscopeinstitute.org. To register for the Annual Celebration of Ministry Retreat click here for the registration form and click here for the Retreat Schedule Registration forms are due August 15, 2013. There will be a $10 fee for late registration. The Episcopal Network for Stewardship (TENS) membership! Good News! The Rev. Laurel Johnston, our stewardship speaker from our leadership day this past year and executive director of The Episcopal Network for Stewardship (TENS), has given the diocese a gift membership to TENS. Free stewardship materials are available by logging on to www.tens.org. Even more materials will be available to our congregations with this gift membership. The diocese will be emailing the password for access to the additional resource materials to all clergy this coming week. Your stewardship chairperson may also have access to the password and additional resources by calling the diocesan office. These resources can prove invaluable as you plan your stewardship programs. 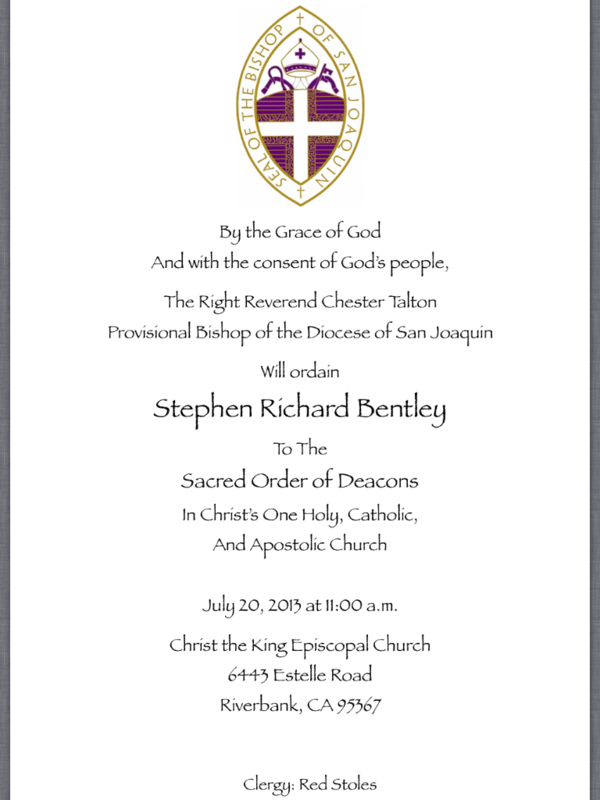 Stephen Bentley was ordained to the diaconate July 20th and is now The Rev. Deacon Stephen Bentley. He will continue to serve at Christ the King in Riverbank. Congratulations! The 2013 Annual Convention Notification packets have been mailed and you should be receiving them by July 27, 2013. A Call to Convention email was also sent to you this week with all forms attached. If you do not receive your notification packet, please contact Ellen Meyer at the diocesan office 209-576-0104 or emeyer@diosanjoaquin.org. Thank you. Please mark your calendar for these upcoming meetings and events. Watch for additional details in the Friday Reflection. Diocesan Council Teleconference Meeting, August 13, 2013, 6:00 p.m.
Italian catered dinner with dessert. Wine glasses are available for $10 each and include two tickets for wine pours. I have informed the Standing Committee and Diocesan Council of my intention to resign as Bishop Provisional of the Diocese of San Joaquin. By the time we come to our Diocesan Convention in October I will have served as Bishop Provisional for nearly three years. I came here with the understand of serving for about two years. I have held from announcing my intended resignation to all of you until now because we were then at a point in the course our legal issues when such an announcement might not have been helpful for our settlement of the returned properties. The time of my resignation is somewhat uncertain, because a successor must be selected. I believe, however that it will be within a few months. The Standing Committee has been at work on finding the next Bishop to present to the Diocese for election since the first of this year. As you may remember from the last election of a Bishop for the Diocese, the Standing Committee shepherds the process in the selection of a Bishop Provisional. The Presiding Bishop’s Office identifies candidates who must be resigned Bishops (as Bishop Lamb and I were) or a Bishop of another diocese who would take on the episcopal leadership of this diocese as well as his or hew own. Once the Standing Committee makes a selection and identifies a Bishop as a candidate a Special Diocesan Convention is called for the election of the next Bishop Provisional. Following that election the Bishop is Seated as Bishop Provisional of the Diocese of San Joaquin. The Bishop Provisional is the Bishop of the Diocese with the election (which I have described for the Provisional above) and that the Provisional serves for a limited period of time. We will have many more times to share about all of this, for now I just offer you my appreciation and my thanks. July 14th will mark the seventh Sunday that the congregation of St. Francis Episcopal Church has been back in their own building. We have already learned a great deal about the people who were there before us, about ourselves, but most especially, about God’s presence with us during this time of transition. The first days after our return were hectic but euphoric as we began to move our own things into the church. We marveled at everything, from the large marble baptismal font with the lovely Pascal candle next to it, to the closets and cupboards filled with office supplies. Sorting through multiple sets of keys was very entertaining, discerning what locks (if any) might be opened. Some of us are list-makers, and those lists of things to do grow longer by the day. With my long experience in retail work, it was obvious that we would need to prepare for a “soft opening” on our first Sunday, and a “Grand Opening” which would be celebrated with Bishop Talton, and many of our brothers and sisters throughout the Diocese of San Joaquin and beyond. From the time we first entered the building, we had only two days to prepare for our first Eucharist service and another week to prepare for the Festival Homecoming Eucharist. The Saturday before our first service, a small army of members gathered to clean every square inch of the church. The following week, we had a cleaning company come to do the biggest job: stripping, cleaning, and waxing the floors in the parish hall, kitchen and bathrooms. On June 9th at 4 PM, we welcomed about 150 people to celebrate our homecoming, and it was a wonderful day that we will never forget! Now that the euphoria and novelty of the initial celebrations have worn off, what is going on new at St. Francis Episcopal Church on East Main? Speaking only for myself, the novelty has really not worn off at all! Each time I enter the sanctuary or the sacristy of the church, I give thanks to God for the blessing of all of it. Even entering the storage room in the office building, (which we have affectionately named “the Dungeon”) packed with years of accumulated items ranging from old desks to leftovers from a rummage sale; I still marvel that we are here to see it all. The challenges of regaining our property are daunting. We are still a small congregation (although attendance is up significantly) and the amount of work that needs to be done is never-ending. Even if the property had been left in pristine condition, maintaining such a large facility takes a lot of labor. Almost every day of the week, our members arrive to water, (especially where the sprinklers are broken), mow, prune, clean, or prepare the church for our Sunday service. These are truly labors of love for those who never thought the day would come when they would have a church to call home. What have I learned from the experience of regaining our church property? First. from the beginning of this process, I was mindful of Bishop Talton’s sermon when he visited us at the Lutheran Church on March 24th, shortly after we learned that we would be getting the building back. He stressed the contrast of Jesus’ entry into Jerusalem with Pilate’s. When Pilate entered the city, he would be mounted on a horse, symbolic of the military force of the Romans and their subjugation of the Jewish people. Jesus mounted on the back of a donkey, entered Jerusalem on Palm Sunday in a spirit of humility, bringing the Kingdom of God with him. To those of you who have never experienced the loss of your church, my advice to you is to give thanks to God for your blessings. Never take it for granted. For those who are currently making the transition from exile back to your building, know that we are praying for you. Take heart that God is at work in all of this, and will send you the gifts and support you need to keep going. And for those who are still waiting to get their property back, be prepared to do so with humility, grace and forgiveness; conserve your resources and your energy for that wonderful day. We need choir members from other parishes to join us on July 28th for the 4 p.m. Festival Welcoming Celebration at St. Paul’s in Bakersfield. If you can help, or would like more information, please email Miriam Vivian: mvivian@csub.edu. Thanks! To register for the Annual Celebration of Ministry Retreat click here for the registration form. Registration forms are due August 15, 2013. There will be a $10 fee for late registration. Register today! The Remain Episcopal (RE) organization is offering grants to help grow local communities of faith, including parishes, missions, deaneries or church organizations. The organization, formed ten years ago with the objective of providing fellowship and education to Episcopalians in the diocese of San Joaquin who felt uncomfortable with the way the diocese seemed to be heading, worked with others around the country to form a network of support for faithful Episcopalians in similar difficulties. That network was named Via Media, after the “middle way” of broad-Church Anglicanism. In the past RE has sponsored numerous daylong workshops throughout the diocese of San Joaquin. The Baptismal Covenant Series gathered in different parishes to explore the meaning in our lives of five parts of Covenant that we as Episcopalians affirm at each Baptism. We will expend all of our resources, gathered from the generous donations of so many throughout the Episcopal Church, in supporting our rebuilding as an appropriate closure for Remain Episcopal, and a catalyst for continued growth and mission outreach. The Rev Kevin Higgins has renewed his vows to the priesthood. He will be assisting at St. Paul’s Episcopal Church in Bakersfield. The Third Order Society of St. Francis: Do you believe in spiritual growth and social justice? You can be both active and contemplative! Explore the possibilities in The Third Order of the Society of St. Francis. Click here for more information: Third Order Society of St. Francis Or contact Terrance Goodpasture, tgoodp@yahoo.com for any questions. And the link is www.tssf.org If you could make the blue wording above to link to the tssf website that would be great. Thanks. Any questions please let me know. Enrollment is open now for classes at Holy Family Episcopal Church in Fresno that will begin in fall 2013. Weekly classes will be held on Sunday evenings and a monthly class (ideal for long-distance commuters) will meet the first Saturday of each month. Read more details on the program at: http://www.sewanee.edu/EFM. EfM grants 18 Continuing Education Units (CEU) for each year of study. There are no examinations or papers. EfM does not grant college credits. The class begins with opening worship and moves into a seminar style discussion of the weekly reading assignment. A theological reflection engages the entire group as they examine how our culture and our tradition shape our everyday life experiences. A group member will offer a closing worship and everyone will be on their way home. You don’t need to be a member of Holy Family to enroll, there are no prerequisites; you do need an open and inquiring mind, ready to go deeper into our faith as Christians. During the month of May, visitors are welcome to come and sit in on a current EfM class any Sunday evening at 6pm. EfM Mentor Training will be held at Holy Family Episcopal Church on Wednesday, July 31 beginning at 3pm, all day Thursday, August 1 ending on Friday, August 2 at 2pm. You do not need to be a current group mentor to attend. The training provides an excellent opportunity to broaden your understanding of EfM, help discern if you have the desire and skills to be a mentor for the Education for Ministry program or to pick up the education required to continue mentoring. Training is offered in small groups of six to eight people. The cost is $195 and includes two meals. It does not cover any overnight accommodations; let us know if you need a list of local hotels. Please complete the attached registration form and send your payment as indicated by July 8th. If you have any questions, feel free to contact the Rev. Michele Racusin by e-mail at mracusin@diosanjoaquin.org or by telephone at 559.439.5011. Click here for registration form. Thanks to all for sending in your news for Friday Reflections and PLEASE keep it coming! Please note that articles are due by 5 p.m. Tuesdays. The picture on the front of the children’s lesson for today has a confidently smiling Jesus waving good-bye to one of the seventy. There is a look of apprehension on the face of the man as he looks back to the safety of the place where Jesus is standing. Actually, I think it might be terror, but then I’m prone to see in the picture what I would feel if it was me. Jesus, the apostles, and a crowd of disciples are journeying throughSamariaon their way toJerusalem. Last Sunday we heard what happened as Jesus came to a village and they refused him hospitality; they went on to another village. Several men ask to follow Jesus, but they all have earthly business to attend to prior to making the journey. We heard last week how difficult the path of following Jesus was – it would be almost impossible to do alone, but we have each other and the Holy Spirit to help us on our journey. The seventy are sent as emissaries to the cities and villages on the path that Jesus is taking toJerusalem. It takes a long time to make this trip. There are lots of opportunities for Jesus to teach his followers and prepare them for the time when he will no longer be there beside them, physically. They are to take nothing with them, and will depend on those who hear their message for food and shelter. The only tools they seem to have are the gifts they’ve been given – to heal the sick and proclaim “that thekingdomofGodhas come near.” Talk about a lesson in humility. They aren’t even allowed to smite those that reject them. Paul builds on this theme in the portion of the letter to the Galatians that we heard this morning. “So then, whenever we have an opportunity, let us work for the good of all, and especially for those of the family of faith.” In verse 4, which we didn’t hear today, Paul instructs them, “All must test their own work…” Hmmm, how would we do if we looked at the past week; what work did we do and what can we expect to reap from what we have sown? Did we do more sowing to our own good, or did we do some sowing to the Spirit? Was the mission for the seventy to sow to their own flesh or to the Spirit? Jesus seems to give them every advantage to insure that their sowing is only to the Spirit. Take nothing of your own on this journey and be content with what you are given. No one will know if the bag you own is Gucci or Target – it’s been left at home. No one will know if your sandals are Birkenstock or flip flops – you’re not wearing them. The formula will be the same each time for all of you: extend your peace, if it is received, then stay and work. Don’t go from house to house making a big deal of yourself. Stay in one place and accept the hospitality given to you. Even when you are rejected, you do not hurl down an insult more than shaking the dust of the place off your feet, and you give them the good news that thekingdom ofGod has come near. The people of that town still have an opportunity to repent and be in relationship with their brothers and sisters. Can you picture yourself being appointed to go on this trip? What would be the hardest thing to leave behind? Picture yourselves dressed all identically, being sent out by twos to travel through downtownStocktoninto southeastStockton. Instead of walking into a village, you walk into a housing project or a tent city of the homeless. Think about that…(pause) would you be able to eat what they had to share? Could you listen to their stories and touch them? A couple lifetimes ago, when I worked for a hotel in SF, the hotel association prepared holiday baskets for people in need. We were sent out in twos to deliver the boxes full of groceries to the poor in the city. I volunteered to help. We were instructed to dress in jeans, sweatshirt, and tennis shoes and to leave everything but car keys back at the office. The reactions from the families we visited were overwhelmingly positive. I think there was only one person who instructed us to just leave the box on the table and go. It felt strange at the time, but on reflection there could have been reasons for their reaction. There were others who invited us in, offered us something to drink, and one person even insisted that we take a plate of cookies they had baked especially as a thank-you. There were times entering buildings that I was scared, but it was like we got a free pass because we were delivering food. At the end of the day, we, like those seventy, returned with joy! We all had experiences to share. The peace that we took on behalf of others was received and returned ten-fold. Now I’m not recommending that we do that. But I do recommend that you look for opportunities to deliver gifts, whether they are backpacks with school supplies, or meals, or to volunteer at a food bank or food kitchen. While it won’t have the drama of walking into a project South of Market, it will have the same reward of sowing to the Spirit. The lesson we can take with us this morning, is the same one that the seventy experienced. Leave yourself behind and go to carry out the command to love one another. “As for those who follow this rule – peace be upon them.” We can do this because we have a promise: the kingdom of God is near. God is going before us, and beside us. And when praise and thanks are heaped upon us because we have dared to answer the call and follow Christ, we can rejoice with each other. But not because we have done any great work, we rejoice that our names are written in heaven. There is no better reward. Amen.